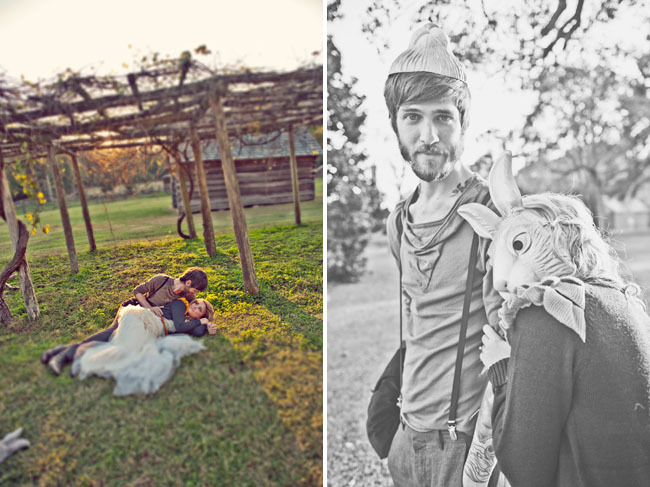 Mary Ellen + Jacob have actually been married for 3 years (congrats to them! ), but they eloped and never had any professional photos of them taken. 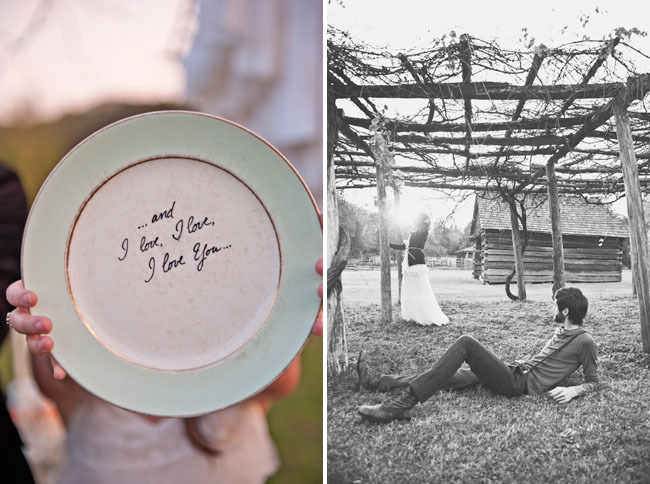 They wanted photos that captured their romantic + whimsical side, so sassyfras studios took some photos of them spending an afternoon together + totally in love. There are also some gorgeous cakes and fun DIY ideas from their shoot, so I thought it was perfect to share with you lovelies. 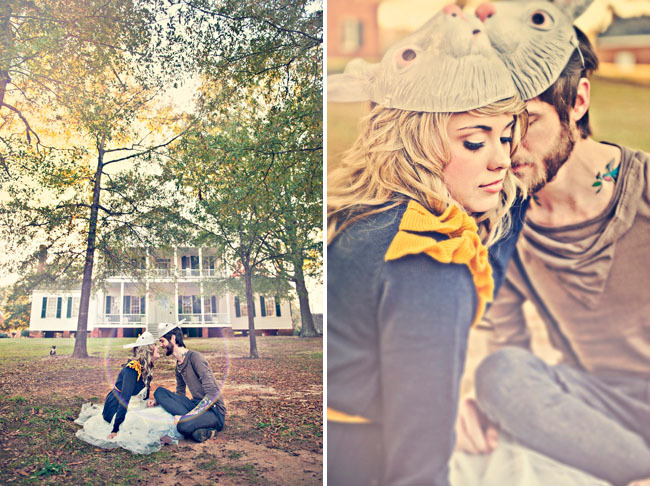 Here’s to whimsical + fun afternoons with your sweetie! 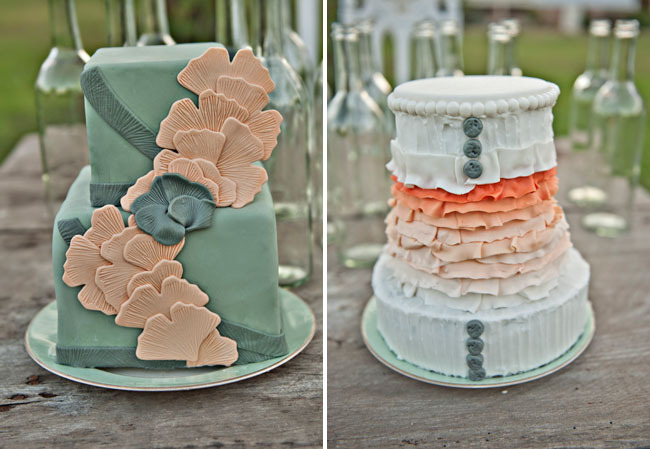 Love both these cakes from sugar cake shop! 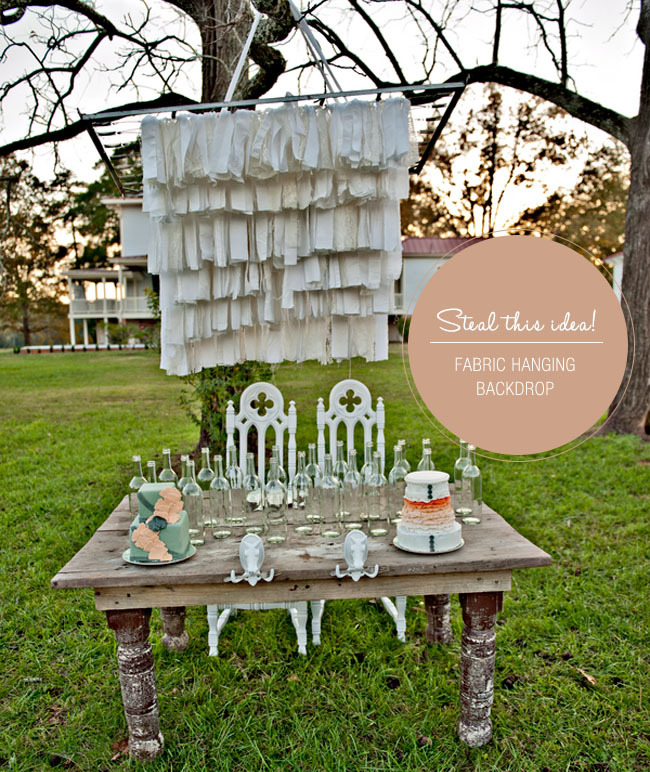 I love the fabric backdrop from the photo above – and it’s easy to make! They used a small bed spring and then hung shredded fabric and lace from each section. Another easy DIY would be the yarn bouquet below. It’s made of yarn balls and yarn leaves. Ack. This is so sweet. I would love to do something like this on our 5 year anniversary. I hope the new husband would be up for something like this! 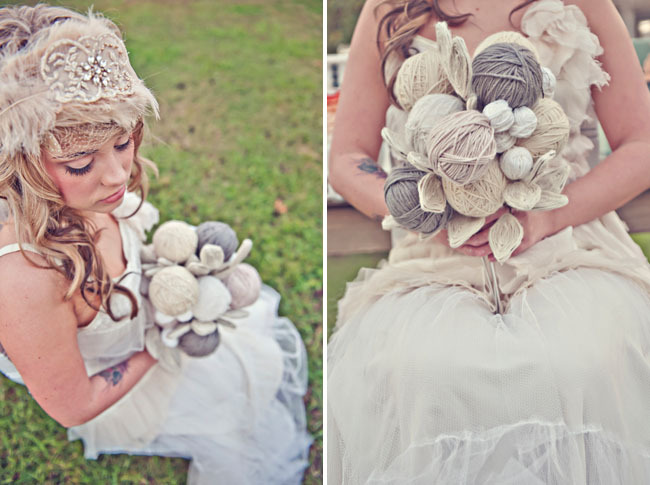 And I love her yarn bouquet! 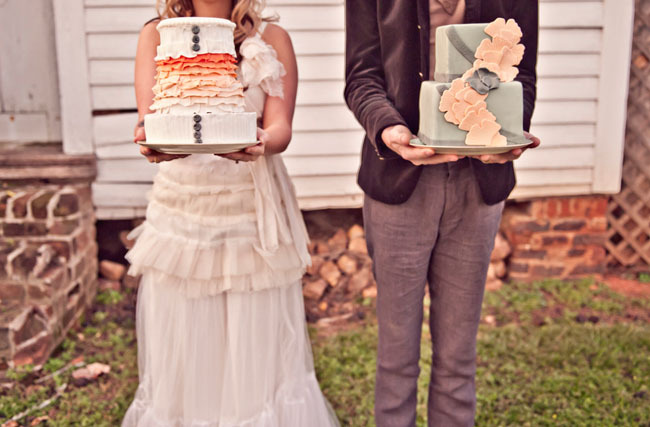 I just LOVE those cakes!! gorgeous, gorgeous, gorgeous!! the sassyfras sisters never fail to AMAZE me. 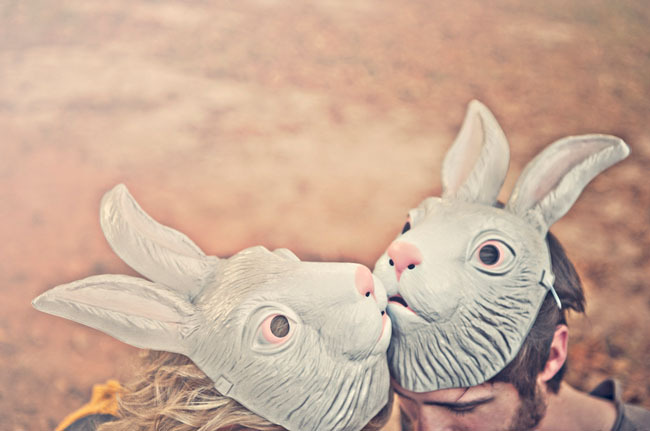 Adorable!The cake design were amazing and so the bunny masks! My husband and I were married at a courthouse and never had photos or really anything to celebrate. We hope to do something like this on year 5. I am in love with that plate! Where did it come from? Seconding the plate love-links please? So sweet! You can really see the love in these shots. And is the quote on the plate from the Pride and Prejudice film??? Love it! Hi. 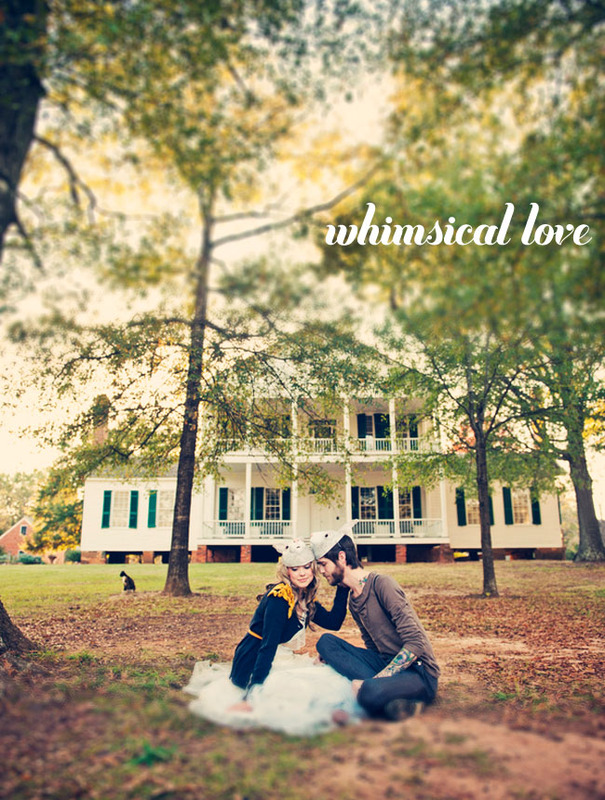 Does anyone know what font was used to write “Whimsical Love” on the first photo? It’s so cute!!! I’ve been looking for something similar. Thank you so much for the lovely feature… we are so thrilled:)!!!! LADIES… we made the plate… the shoot was for a workshop we did that was pride and prejudice themed. THere was another plate that said you have bewitched me body and soul.. We actually made both… I know Crazy right hahaha. WE just used a paint pen, but I imagine there are ALOT of pottery places that you could make one, then get it glazed so it wouldn’t come off.. just an idea:)! Positively creative, unique and awe-inspiring. 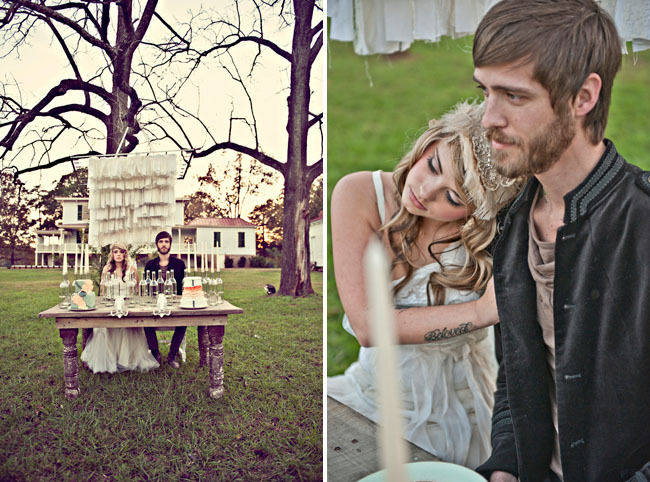 Awesome ideas here and love love this shoot! Totally fabulous top to bottom. LOVE!